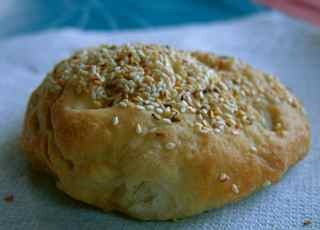 Shaobing is one of the most popular ‘bakeries’ in China, or probably we say that it is a ‘dian xin‘ from North China. Here, you probably can see the difference between North Chinese food and Cantonese food. I just noticed that in some English translations, shao bing is referred to as ‘flat bread’. Well, if it is just ‘flat’ ‘bread’, there are far too many flat breads in Chinese food. The amount of flour needed depends on how many you want to prepare. I normally use four and half cups of plain flour, and 1 sachet of dry yeast (7g) for the making around 10 -12 shaobing, mixed with one and 1/3 cup of warm water, and 2 teaspoons of salt. Knead the dough well, and leave for one hour or wait for it fully raised. Dissolve 3 tablespoons of sesame paste in .. probably 1 tablespoon of water and 2/3 teaspoon of salt — the sesame mix is supposed to be a bit salty, so it all depends on your taste. The mix should be neither liquid, nor very thick. 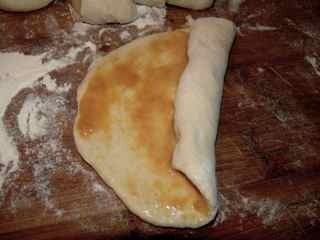 1) Divide the dough into smaller portions, around 4-5cm wide, around 7-8cm long, and about 3cm thick. 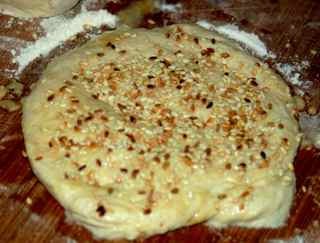 3) Spread prepared sesame mix on the flat sheet. 4) Roll up the ‘sheet’ tightly. 5) Place the roll ‘standing’ on the board, use both hands to hold each end of the ‘roll’, and twist as many rounds as you can (one hand should firmly hold the end ‘stand’ on the board, so the bottom is not moved). 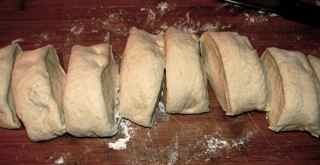 6) Use your palm to press the top of ‘twisted’ roll down the bottom. 7) Sprinkle toasted sesames on top of the ‘dough’, enough to cover the top surface, and press them well into it. Place well prepared shao bing into pre-heated oven. Unfortunately, I cannot tell exactly how many minutes you need to bake them — yes, careless me. I would say around 15- 18 minutes, but when the top surface turns a little bit brownish — they are done! 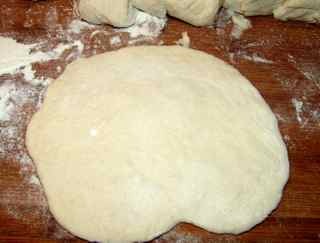 Prepare the dough as indicated in the main text of the post. Dissolve 3 tablespoons of sesame paste in 1 tablespoon of water and ⅔ teaspoon of salt. 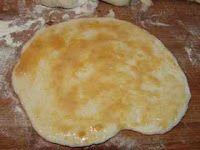 Divide the dough into smaller portions, around 4-5cm wide, around 7-8cm long, and about 3cm thick. Spread prepared sesame mix on the flat sheet. Roll up the ‘sheet’ tightly. Place the roll ‘standing’ on the board, use both hands to hold each end of the ‘roll’, and twist as many rounds as you can. Use your palm to press the top of ‘twisted’ roll down the bottom. Sprinkle toasted sesames on top of the ‘dough’, enough to cover the top surface, and press them well into it. Place well prepared shao bing into pre-heated oven for 15-18min.